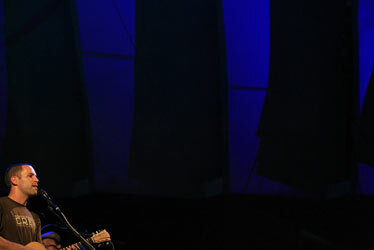 Jack Johnson performed on a darkened Waikiki Shell stage Saturday during the 2008 Kokua Festival, the sixth annual benefit for the environmental causes of Johnson's Kokua Foundation. 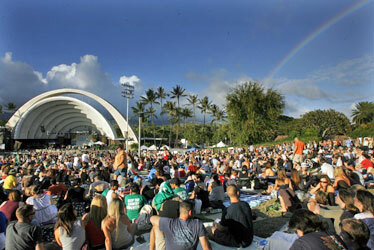 The Waikiki Shell is a nearly ideal site for Jack Johnson's Kokua Festival. Not only does its limited size keep the fest from turning into a monster, it's on bus and trolley routes and within walking distance for mainland fans staying in Waikiki hotels. But mainly, a trick of the landscaping turns the level area behind the seats into an enviro-arcade, a Main Street of cheerful businesses, lobbying organizations and self-help groups dedicated to making Earth livable. It's in this area that the special nature of the Kokua Festival comes alive. "It's been tremendous -- so many people with questions," said Dwight Streamfellow, of 21st Century Technologies, a company that deals in water and energy conservation for the home. There's a sense of community in the enviro- arcade, added Streamfellow after a former customer stopped by to chat about conservation tips. "The people here are predisposed to be interested in the subject. I love Jack Johnson's music -- but our cause here is the environment." 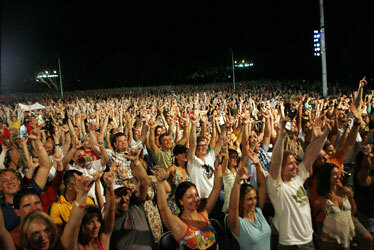 The sold-out crowd flashed a collective shaka. The wise man said there's no such a thing as a free lunch, except in mousetraps. Everything costs, even in ways that cannot be easily imagined, which is why the trope of the "carbon footprint" was established, so that an individual's unwitting contribution of energy-related carbon dioxide can be added to greenhouse gasses. Everything you do, it seems, adds to the gaseous atmospheric scab that is slowly baking the planet. 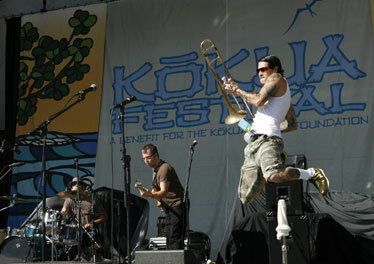 Trombonist Ryan Kunimura of the local band Go Jimmy Go went airborne during the band's set. 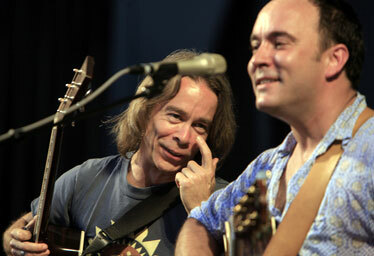 Dave Matthews, right, and band mate Tim Reynolds added star power to the Kokua Festival concert bill. The first baby step toward environmental awareness, of course, is the unsettling notion that while being proactive is good, being passive is destructive. Ouch. That's likely why you didn't see a Hummer or a limo anywhere near the Kokua Festival at the Waikiki Shell over the weekend. Jack Johnson's annual benefit for his Kokua Foundation can be viewed as a celebration of smug, self-referencing do-gooderness or an honest attempt to educate while entertaining -- and the two extremes don't cancel each other out. The crowd consists of the already converted. Which is a good reason to park the car at Kapiolani Community College and take the hired trolley to and from the festival. Why contribute to Waikiki's already massive carbon footprint? "The folks going down to the show are mellow, really mellow," offered trolley driver Tony Hroncich. "But I expect they'll be more excited and rowdier on the way back. Concerts are like that. But for now, everybody's laid-back. Way laid-back." So laid-back that many, according to Hroncich, thought the concert was free. Instead, they found that the Shell was mobbed and scalpers were selling tickets for hundreds of dollars. A couple of thousand ticketless fans simply squatted in Kapiolani Park to soak up, by aural osmosis, the vibe wafting outside the security perimeter. Not free. This year's festival sold out in less than two hours. Newlyweds Justin and Jamie Burriss of Murfreesboro, Tenn., "turned on two computers and four screens to buy whatever seats we could" the minute they went on sale. They scored but admitted it was a near thing. All tickets were gone a few seconds after they got theirs. "You don't really hear much music like this -- it comes from the heart," said Justin. "It's not manufactured. Jack Johnson's so cool that we're tempted to move here and take up surfing permanently." A rainbow greeted the audience Saturday afternoon during the Kokua Festival at the Waikiki Shell. 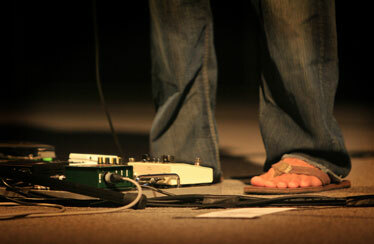 Jack Johnson's slipper-clad foot, next to his pedal board onstage, illustrated the informal concert atmosphere. The enviro-wareness of the scene makes one question the carbon footprint of everything. The food runs toward margaritas, cheeseburgers, garlic fries and minidoughnuts. Gotta be a carbon footprint there, unless they're using mirrors to cook the wienies. Most of the merch is cash-only. Is credit or debit less carbon-dioxible? Lots of sandals, natural fabrics, water bottles being reused. The enviro-peer pressure is working. The trees look happy. Our photographer says they've been hugged a lot. The age range is broad. One thing you can say about Jack Johnson, he produces family-friendly music. Oh yeah, the music. From the exciting ska of Go Jimmy Go to the Jawaiian punk poetry of Paula Fuga, the afternoon passes in a daze. Then Dave Matthews and Tim Reynolds take the stage in a blazing display of picking and flailing -- Reynolds pretty amazing in a controlled-feedback rendering of "After the Gold Rush" -- and then Johnson puts the button on it with a rousing, heartfelt set. This is his baby, after all. "I like those little water bottles!" enthused Matthews from the stage. "Fill 'em up ... keep reusing. How about that!" The crowd cheered. Mostly for themselves, but then, you didn't see many water bottles littering the area either. 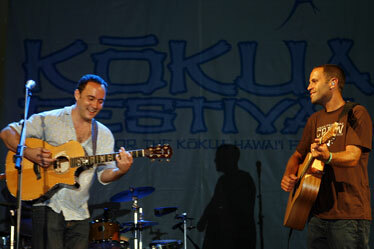 Dave Matthews, left, and Jack Johnson shared the stage. 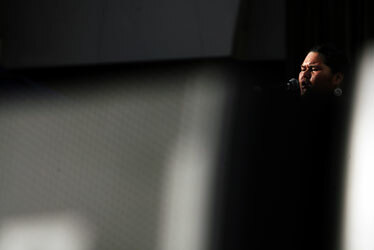 Singer Paula Fuga, right, sang solo.